Her first thought is that the rabbits are jumping over the fence, so we should make the fence higher. I explain they are likely going underneath. OK. Next thought. We should dig down way into the ground and make the fence go deep, deep down. And still make it higher for good measure. Just in case they can still jump over it. When I asked her who would do all this, she sat for a minute and came up with a different, much less labour-intensive idea. A sign. 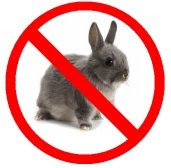 A sign that says "NO RABBITS". :) She said, "When they see the sign with them with a red line through it they will know they can't come in the garden."